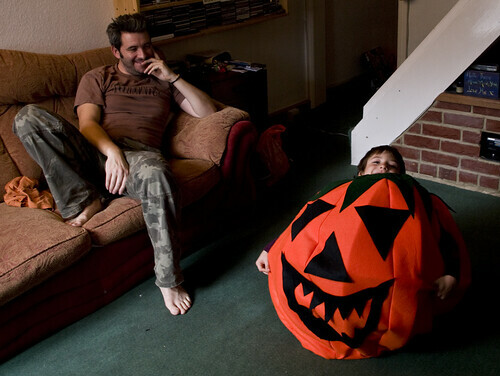 If you’ve ever wondered how to make a pumpkin costume here’s how one’s made in the Wealie household. Ben was in charge of the frame and measurements (metal work and mathematics are not my strong suit). I handled the sewing of the fabric, adding the fine details of the face and leaves and the dubious pleasure of putting the whole thing together with my glue gun! It’s actually quite an easy pattern, with a few little fiddly bits, but here’s how to make it. Firstly you need to make three hoops of wire, one to go around the neck (make sure it fits comfortably with a fair amount of room over the head, as you will be adding layers of fabric on top), one for the middle (this should be the widest that you want your pumpkin to be and finally the legs (make sure the hoop is wide enough that the wearer will be able to walk unimpeded). To measure for the hoops you can measure a straight line across to give you the width from one side to the other of the circle, (the diameter), you then multiply the diameter by 3 to get the circumference (the length of the circle if you were to cut it, flatten it out into a straight line and then measure it end to end). Next you need 8 lengths of wire that you attach to the different hoops at the neck, middle and legs, these are your supporting struts and also the segments of the pumpkin. If you are able to welding is probably the best method of attaching the hoops and struts. However, if like us you don’t have that kind of equipment, then insulation tape is an acceptable alternative, though not as robust! Once you’ve attached the frame together make sure you get the wearer to test it out before you go any further! Now to cut out your fabric. Divide the circumference of each hoop by eight and these are the measurements of the top, middle and bottom for each pumpkin segment. For a small boy like Dylan each segment was about 30 cms at the widest point (the middle) and the strut lengths were about 9o cm. So allowing for hemming cut a 40 cm by 1 metre length of orange felt. On the back of the length measure out from a central point and mark up the width of the top middle and bottom, allowing a 4-5 cm hem at the top, bottom and on each side. Then you need to draw a curve from the top to the middle and the middle to the bottom on both edges of the fabric from both the sewing lines and hem lines. You should have drawn an elongated oval segment, which is slightly wider at the bottom, with parallel lines around 4-5 cm apart up to the edge of the fabric. Once you’re happy with the measurements cut out the segment along the hem line and use this as the pattern template to cut out a further 7 segments. Once you’ve cut out all the segments you’ll need to mark up the sewing line on a further 3 segments. To avoid measuring up again place the three extra pieces of fabric beneath your original pattern and using your scissors stab points along the lines to go through onto the fabric beneath. Lift off the template and then mark up the lines on each of the pieces of fabric beneath. Pin together each of the marked up segments with an unmarked segment and stitch along the sewing line on the right from top to bottom. Once you’ve stitched together each pair begin to stitch together the pairings, again stitch the marked segments to an unmarked one. Be careful you always stitch from the top down to put the pattern together correctly. Once all the segments are stitched together wrap them around the frame and pull them taut. You should be able to overlap the two end segments. Whilst one person is holding the segments together another needs to glue the segments down using a glue gun or fast acting fabric glue. 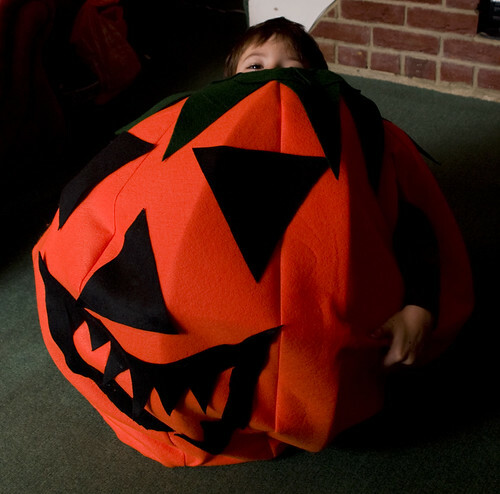 Now you can loop the hems over the top and bottom hoops, gluing them down as you work around the pumpkin. Now it’s time to add the detail, cut out a face from the black felt, we went with triangles for the eyes and nose and a big spiky mouth and then glue them onto the main body where you want them. Finally cut out 8 triangles from the green felt to make the leaves. Glue them onto the neck hoop and slightly overlap them to ensure that all orange felt around the neck in covered. That’s the hard work over, now you need to get your wearer to put it on and indicate where the arm holes need to go. Simply cut a slit in the felt that they can put their arms through. Add a trick or treat bucket and they’re ready to go! 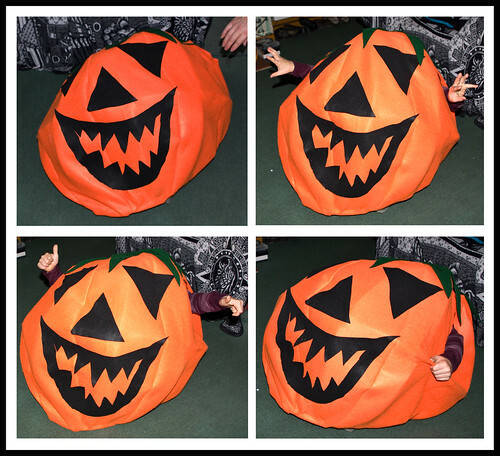 The result for us is Fred the pumpkin (Dylan chose his name), who is almost as wide as Dylan is tall and only just got through the doorway (something you might want to take into consideration before building it)! 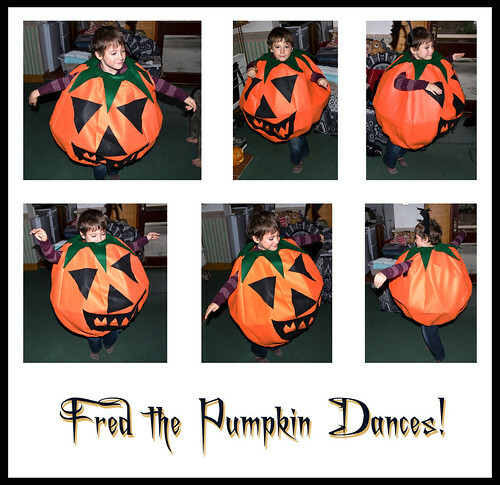 The picture below is of Dylan (sorry Fred), dancing to the pumpkin rock which Ben was making up on his guitar as Dylan danced! Happy Halloween and happy pumpkin making! 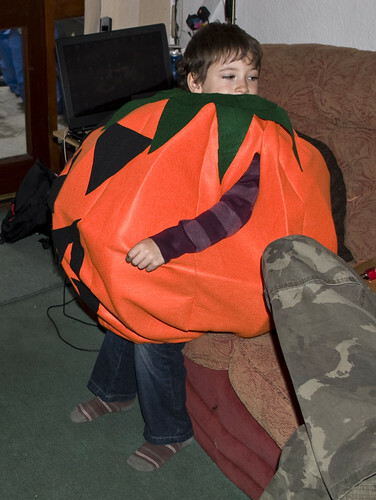 This entry was posted in My Art, My Blog, Other, Photography and tagged arts and crafts, costume, fancy dress, fancy dress costume, fancy dress pumpkin, Halloween, Halloween 2010, halloween costume, how to make a pumpkin costume, photo, photograph, photography, pumpkin, pumpkin costume, ruth weal, wealie. Bookmark the permalink.